"Double platinum" redirects here. For other uses, see Double platinum (disambiguation). "Gold record" redirects here. For the record included in the Voyager spacecraft, see Voyager Golden Record. Music recording certification is a system of certifying that a music recording has shipped, sold, or streamed a certain number of units. The threshold quantity varies by type (such as album, single, music video) and by nation or territory (see List of music recording certifications). Almost all countries follow variations of the RIAA certification categories, which are named after precious materials (gold, platinum and diamond). The threshold required for these awards depends upon the population of the territory where the recording is released. Typically, they are awarded only to international releases and are awarded individually for each country where the album is sold. Different sales levels, some perhaps 10 times lower than others, may exist for different music media (for example: videos versus albums, singles, or downloads). The original gold and silver record awards were presented to artists by their own record companies to publicize their sales achievements. The first silver disc was awarded by Regal Zonophone to George Formby in December 1937 for sales of 100,000 copies of "The Window Cleaner". The first gold disc was awarded by RCA Victor (under division imprint Bluebird Records) to Glenn Miller and His Orchestra in February 1942, celebrating the sale of 1.2 million copies of single "Chattanooga Choo Choo". 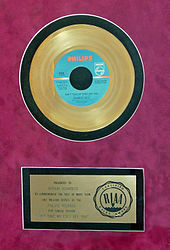 Another example of a company award is the gold record awarded to Elvis Presley in 1956 for one million units sold of his single "Don't Be Cruel". The first gold record for an LP was awarded by RCA Victor to Harry Belafonte in 1957 for the album Calypso (1956), the first album to sell over 1,000,000 copies in RCA's reckoning. At the industry level, in 1958 the Recording Industry Association of America introduced its gold record award program for records of any kind, albums or singles, which achieved one million dollars in retail sales. These sales were restricted to U.S.-based record companies and did not include exports to other countries. For albums in 1968, this would mean shipping approximately 250,000 units; for singles the number would be higher due to their lower retail price. 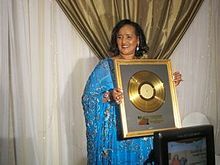 The platinum certification was introduced in 1976 for the sale of one million units for albums and two million for singles, with the gold certification redefined to mean sales of 500,000 units for albums and one million for singles. No album was certified platinum prior to this year. For instance, the recording by Van Cliburn of the Tchaikovsky Piano Concerto from 1958 would eventually be awarded a platinum citation, but this would not happen until two decades after its release. In 1999, the diamond certification was introduced for sales of ten million units. In the late 1980s, the certification thresholds for singles were dropped to match that of albums. The first official designation of a "gold record" by the Recording Industry Association of America (RIAA) was established for singles in 1958, and the RIAA also trademarked the term "gold record" in the United States. On 14 March 1958, the RIAA certified its first gold record, Perry Como's hit single "Catch a Falling Star". The Oklahoma! soundtrack was certified as the first gold album four months later. In 1976, RIAA introduced the platinum certification, first awarded to the Eagles compilation album Their Greatest Hits (1971–1975) on 24 February 1976, and to Johnnie Taylor's single "Disco Lady" on 22 April 1976. As music sales increased with the introduction of compact discs, the RIAA created the Multi-Platinum award in 1984. Diamond awards, honoring those artists whose sales of singles or albums reached 10,000,000 copies, were introduced in 1999. In the 20th century, and for a part of the first decade of the 21st, it was common for distributors to claim certifications based on their shipments – wholesale to retail outlets – which led to many certifications which outstripped the actual final retail sales figures. This became much less common once the majority of retail sales became paid digital downloads and digital streaming. In most countries certifications no longer apply solely to physical media but now also include sales awards recognizing digital downloads (in the U.S. and U.K. since 2004). In June 2006, the RIAA also certified the ringtone downloads of songs. Streaming from on-demand services such as Apple Music, Spotify, Tidal and Napster has been included into existing digital certification in the U.S since 2013 and the U.K. and Germany since 2014. In the U.S. and Germany video streaming services like YouTube, VEVO, and Yahoo! Music also began to be counted towards the certification, in both cases using the formula of 100 streams being equivalent to one download. Other countries, such as Denmark and Spain, maintain separate awards for digital download singles and streaming. The International Federation of the Phonographic Industry (IFPI) was founded in 1996, and grants the IFPI Platinum Europe Award for album sales over one million within Europe and (as of October 2009) the Middle East. Multi-platinum Europe Awards are presented for sales in subsequent multiples of one million. Eligibility is unaffected by time (from date of release), and is not restricted to European-based artists. The Independent Music Companies Association (IMPALA) was founded in 2000 to grow the independent music sector and promote independent music in the interests of artistic, entrepreneurial and cultural diversity. IMPALA sales awards were launched in 2005 as the first sales awards recognising that success on a pan-European basis begins well before sales reach one million. The award levels are Silver (20,000+), Double Silver (40,000+), Gold (75,000+), Double Gold (150,000+), Diamond (200,000+), Platinum (400,000+) and Double Platinum (800,000+). 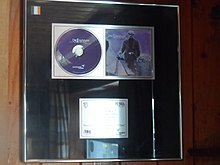 Platinum record awarded to De Dannan by the Irish Recorded Music Association for their 1999 album How the West Was Won. In Ireland, a recording must sell 15,000 units to be certified platinum. Below are certification thresholds for the United States, United Kingdom, Canada and France. The numbers in the tables are in terms of "units", where a unit represents one sale or one shipment of a given medium. Certification is often awarded cumulatively, and it is possible for a single album to be certified silver, gold, and platinum in turn. An album that becomes Platinum twice over, for example, an album which has sold 2,000,000 copies in the United States, is said to be "Double-Platinum", or sometimes "Multi-Platinum". Since 2013 in the U.S., and 2014 in the U.K. and Germany, streaming of songs counts towards certification of singles with 150 streams being the equivalent of 1 unit sold. Since February 2016, RIAA includes on-demand audio and video streams and a track sale equivalent in Gold and Platinum Album Award. The program will count both sales and streams for single and album certifications. The plaques themselves contain various items under the glass. Modern awards often use CDs instead of records. Most gold and platinum records are actually vinyl records which have been vacuum metallized and tinted, while trimmed and plated metal "masters", "mothers", or "stampers" (metal parts used for pressing records out of vinyl) were initially used. The music in the grooves on the record may not match the actual recording being awarded. Individual plaque-makers produced their awards according to available materials and techniques employed by their graphic arts departments. The plaques, depending on size and elaborateness of design, cost anywhere between US$135 and $275, most often ordered and purchased by the record label that issued the original recording. ^ "Alan's treasured possessions". Alan Randall's Memorabilia. Retrieved 12 June 2017. ^ Bret, David (2014). George Formby: An Intimate Biography of the Troubled Genius. Lulu Press. p. 54. ISBN 978-1-291-87257-6. ^ Venable, Shannon L. (2011). Gold: A Cultural Encyclopedia. ABC-CLIO. ISBN 0-313-38431-2. ^ a b Shelton, Robert (1986). No Direction Home: The Life and Music of Bob Dylan. New York: William Morrow. p. 389. ISBN 0-688-05045-X. ^ a b White, Adam (1990). The Billboard Book of Gold & Platinum Records. Billboard Books. p. viii. ISBN 978-0-7119-2196-2. ^ "Gold & Platinum: Eagles/Their Greatest Hits 1971 - 1975". RIAA. Retrieved 14 August 2017. ^ "Story of Gold & Platinum". RIAA. Retrieved 14 August 2017. ^ "Gold & Platinum: Platinum Awards". RIAA. Retrieved 14 August 2017. ^ "About the Awards". RIAA. Retrieved 14 August 2017. ^ Price, Jeff (28 April 2011). "Getting A Gold Record By Selling Nothing". TuneCore. Retrieved 7 July 2015. ^ "Goodbye, 2004. Hello, 2005!". Recording Industry Association of American. Retrieved 23 June 2012. ^ "RIAA Adds Digital Streams To Historic Gold & Platinum Awards". RIAA. Archived from the original on 24 September 2015. ^ a b Alex Pham (9 May 2013). "Exclusive: On-Demand Streams Now Count Toward RIAA Gold & Platinum". Billboard. ^ "Neuer DIAMOND AWARD für die erfolgreichsten Singles und Alben in Deutschland" (in German). Bundesverband Musikindstie. Archived from the original on 26 June 2014. Retrieved 15 May 2014. ^ IFPI Denmark: Guld og platin (2014) (in Danish). IFPI Denmark. 2014. Retrieved 31 May 2014. ^ "Listas semanales: 14 July 2014 – 20.7.2014" (in Spanish). PROMUSICAE. July 2014. Archived from the original on 27 July 2014. Retrieved 21 August 2014. ^ a b Kreisler, Lauren (22 June 2014). "UK's Official Singles Chart to include streaming data for first time". Official Charts Company. Retrieved 12 March 2017. ^ Spahr, Wolfgang (7 January 2014). "Streaming Tally Joins Germany's Official Charts". Billboard. ^ "RIAA Accepts Streams for Gold and Platinum Certifications". Billboard. 1 February 2016. Retrieved 12 March 2017. ^ "RIAA Debuts Album Award With Streams, Sam Hunt And More Receive Awards". AllAccess. 1 February 2016. Retrieved 1 February 2016. ^ "Certification Criteria". Recording Industry Association of America. Retrieved 22 June 2012. ^ "History of the Awards". Recording Industry Association of America. Archived from the original on 1 July 2007. Retrieved 22 June 2012. ^ "Certified Awards Search". British Recorded Music Industry. Retrieved 20 September 2014. ^ "Certification Definitions". Music Canada. Retrieved 15 March 2015. ^ "Les certifications". National Syndicate of Phonographic Publishing (Syndicat national de l'édition phonographique). Retrieved 22 October 2016. ^ "All That Music is Not Gold". Reno Gazette-Journal. 12 March 1998. p. 65. Wikimedia Commons has media related to Music recording sales certification. This page was last edited on 14 April 2019, at 01:47 (UTC).